Engineered for optimum eye protection, with a detachable nose-guard and large soft fitting ears, the Rambo Plus Flymask is the most effective choice for combatting flies this summer. The Rambo Plus features an extremely durable textilene body, soft polyester ear material, and comfortable fleece edging for luxurious comfort. I really like the mask because I try and find masks that I can keep from rubbing on his eyes. He is blind in one and very far sighted in the other due to cateracts that were removed. He developed a fungus and bacteria in one which caused him to go blind and has to have something on 24/7 so he don't hit his eye. This mask has made my and his life so much nicer. No rubbing the brow or eye. I just wish they were made with a black mesh. He seems to see better out of the darker ones. I've been using this on my "busy" gelding for two years, and he hasn't managed to destroy it yet. It also stays away from his eyes, which I like, and the nose flap keeps his white nose from getting sunburned. He doesn't try to get it off, either, unlike other fly masks we've had. I have had these fly masks before and they were amazing! They lasted a couple of years with daily use throughout the summer. The velcro closures and stiff stays make them easy to put on and stay on without interfering with my horses eyes at all. The reason I only gave them a 4 instead of 5 stars is that the sizing was always on the large side, but they seem even larger now. One of my horses (who I got the small ‘pony’ size for) I have to cinch it up more than it is made to do to keep it on. It’s not a problem, but it would be nice if the fit had been consistent. My horses have an uncanny way of removing their fly masks and tearing them up...these stay put really well, and I would imagine with "visor" that keeps it off their eyes makes it more comfortable. If they keep these without tearing them up, then they are worth the price. Really nice! Made very well and it stays out of his eyes! It’s hekd up great compared to other brands I’ve bought . Other fly masks tend to rub my horse’s eyes or irritate the lashes. She has a high sensitivity to the bright sun, even in the winter and this fly mask helps her. I don’t get as much discharge from her eyes. I did take the nose extension off because it came down over her nostrils and I did not want it to interfere with her air intake, especially in the hot summer. This mask fits my big Thorobred like it was custom made for him. He is blind in one eye, and on the advice of the vet, must wear the mask everyday to avoid further injury to it. I would never want him to be without this particular mask for as long as he's alive; it's that vital to his health. It's comfortable on him, easy to apply, and well made of quality materials. The velcro is perfectly positioned for the correct fit, with detachable nose piece. The first mask lasted about 8 months, and is still wearable, but it beginning show signs of wear around the ears, and the stay has come loose. I used some duct tape to keep the stay in place until the new mask arrived. Fantastic product!! All my other Connemaras wear these fly masks. I ordered a pony size but find it basically the same size as my other cob sized Rambos. It fits her well. My 17'2 WB hates fly masks and I went through 5 different styles and brands before finding this one. In three years I'm about to purchase my third one for him. He's a chestnut so is very sensitive and even more particular about what he does and doesn't like. The price is high, but I've never seen another brand last as long! 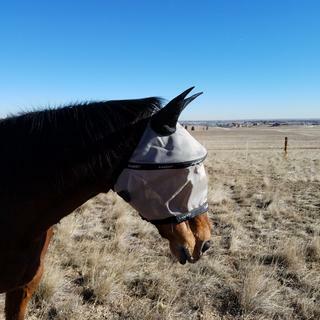 I am happy with this fly mask, but after reading other reviews of it running large, I am certainly glad I ordered the cob size for my Quarter Horse mare, it fits her perfectly. The cob size was HUGE. In fact the whole thing was HUGE. My horse tore it off and stomped into the mud, so I can't return it. I'm still looking for a fly mask that won't come off and won't rub his eyes. too large for my shetland pony! I have been using this fly mask for several summers now on all six of our horses. I like that the nose protector is removable. It get pretty yucky every day ao I can clean the small piece easily in the tack room sink. The best feature is the hoop that keeps the fly mask off the horses eyes and I thinky horses are more comfortable because of thia feature. I have fpund the durability to be about the same as other brands. A lot depends on the horse. Some are tougher on them than othera. Check around on pricing. My local tack shop has these priced at $34.95 which ia considerably leas and saved me on shipping. Overall I give this fly mask a high rating! I have a blind pony. She recently had to have one eye removed. The specialist equine eye surgeon recommended the Rambo because of the stiffness of the rod in it, so it won't poke into her eye area. I have a Morgan who wears a Cob size. I purchased the Cob size and it is way too big! The ears look big enough for a donkey on him! So I am trying the regular pony size. Hope this fits better! this is the ultimate in fly masks, stays ON and doesn't crinkle inward to poke them in the eye. I want something that brings the mask away from the eyes. This one does the job and does it well. It keeps the mask away from his eyes. My horse scratched her eye and needs it to be protected. I'm trying this one and one other to see which works best for her." I am looking for a fly mask that has generous eye coverage - my horse's head is a combination of regular and cobb measurements, so I suspect the cobb size may work if the eye area is generous in size. Rib above eyes keeps fly mask away from the eye surface. Excellent quality. Stays on. After getting healing from cornea ulcers, my horse's ophthalmologist recommended using it to prevent future injury. Apparently it should "bounce back" into shape and makes it much harder to rub the eye. This mask is our go to design. The rib across the eyes gives the most unimpaired vision and freedom for the horse. Has lasted very well. Ear tips go first. Keeps mask away from eyes. I have had my old Rambo for over 2 years, using all summer long (Florida!). Still good, no holes. Needed new Rambo for new horse, old mask was to big for my new horse. A word of warning......This mask runs very large. Cobb size fits my 15.2 quarter horse. Horse size was a little bit big on my 17 hand warm blood. Our horse gets very itchy in the summer. The distance this fly mask is off her face helps with her not creating injury to her face. I do wish they made an earless version since our horse hates her ears being covered, but a small modification with scissors and she is keeping it on her face! I have a mare that shy's away from moment off to the side of her. do you sell blinders? BEST ANSWER: Hi Cindy. I don't know if Stateline sells blinders, but I have purchased several of the Rambo fly masks, and they are amazing. Not sure if that helps; Stateline asked me to answer your question, but we don't use blinders. Have you had a vet check her vision? Unfortunately we only carry blinders as part of a full harness purchase. What is the UV blockage percentage? BEST ANSWER: Iâ€™m not sure about giving it a â€œnumberâ€ but I can tell you this mask is superior to the other standard fly masks available in blocking sun exposure. I bought this at my vetâ€™s recommendation when my 22 yo gelding was diagnosed with uveitis. I was to protect his eyes from direct sunlight which aggravated the condition. I used this mask during the hottest summer months. Itâ€™s more durable and heavier so I didnâ€™t use in winter or cooler months. His eyes stayed relatively clear of swelling with the Rambo mask. Hope this helps some! I'm not sure the percentage, but if your looking for a mask the blocks out about 95% it's the guardian face mask. I used it years ago for a photophobic headshaker and it's also recommended for a horse with uvitis. Very different looking ,but does what you are looking for. I felt the Rambo was too clunky. Iâ€™m not sure what the UV protection is, but it does a great job protecting my mares white face from burning in the hot Oklahoma sun. Hi there Iâ€™m not sure .. I never used it the black seam line on the face front is right in line with their eyes!!! Will the Rambo fly mask fit a warm blood? I have a 15' 3 hand paint that has a very large head. He wears large horse size. I ordered him the large horse size and it fits but is very roomy. I have another horse that has a smaller head and I got her the cob size and it fits her nicely. They offer a lot of eye protection which is what I needed. I hate when the other masks squish down on their eyes. These run very large, I have a regular sized head on my horse who is part warmblood, and I use the Cobb size.. If you have a larger warmblood something over 16 Hands between 16 and 18, with a larger head, I would get the full size.